Personalized training , that is to say, through tutorials and personalized corrections, the student decides the level of training that adapts more to their requirements. These are the phases in which we divide our methodology, that is, a phase of analysis of the current state, propose a project based on the analysis made, considering the feasibility of the same, materialize the project, as far as it can and, finally learn how to communicate the project to the client. 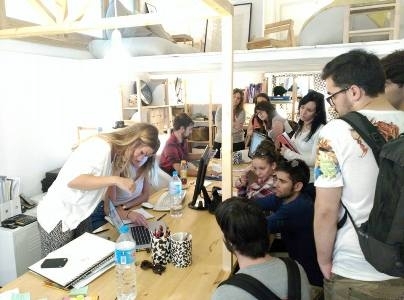 We train professionals in Interior Design, Architecture, Urban Regeneration and Rehabilitation. Principles of On-Line Interior Design. Custom time and duration. Duration: 20 hours. 2 Credits. Cost: 90 € Ordinary Registration. 60 € University students. Certificate: Every two months will be issued an Official Diploma issued by the University of Salamanca. Extraordinary Course: Regeneration and Urban Design, On-Line. Custom time and duration. 20 hours. 2 Credits. Cost: 90 € Ordinary Registration. 60 € University students. Matriculation in University of Salamanca. Principles of Rehabilitation in Building. Cost: 90 € Ordinary Registration. 60 € University students. Certificate: Every two months will be issued an Official Diploma issued by the University of Salamanca. Know the study and work phases of a rehabilitation and restoration project. Study a real building restoration project, to familiarize yourself with the usual work methodology in a restoration and rehabilitation project. The student will add value to their projects and working groups. At the end of the course will be delivered an Official Diploma issued by the University of Salamanca. It is a course open to all kinds of people, no prerequisite is necessary. With the enrollment in the Extraordinary Course will be able to have access to the Studium platform, will be informed once enrolled how to access and how to download the topics and upload the exercises. DATES: Free and Customized. Recommendation: 2.5 months (15 December - 28 February). MODALITY: ONLINE. (With possibility of optional face-to-face tutorials). CREDITS: 15 PRICE: € 1,125. Specific topics of rehabilitation will be developed, the student will learn the appropriate technical terminology, however, being very personalized teaching each student will mark his own level. We think that a specific module on rehabilitation is necessary to understand urban regeneration in its entirety by applying the new technologies for the improvement of habitability, accessibility, for a safe, healthy and accessible environment. DATES: Free and Customized. Recommendation: 10 months (October-July) CREDITS: 60. We understand that the best way to learn is to practice, and the best way to become an Interior Architect is to do an Interior Architecture Project as it is done in the professional world.